I need family-friendly outdoor games for summer socials, festivals and fundraising events that kids and adults can play quickly. Perennial favorites for everyone, easy to set up, easy portability and compact storage is my goal. When possible, I choose designs that kids can help make for fun. Here are some of my personal age and family-friendly outdoor games that are perfect for summer events with large crowds or small. 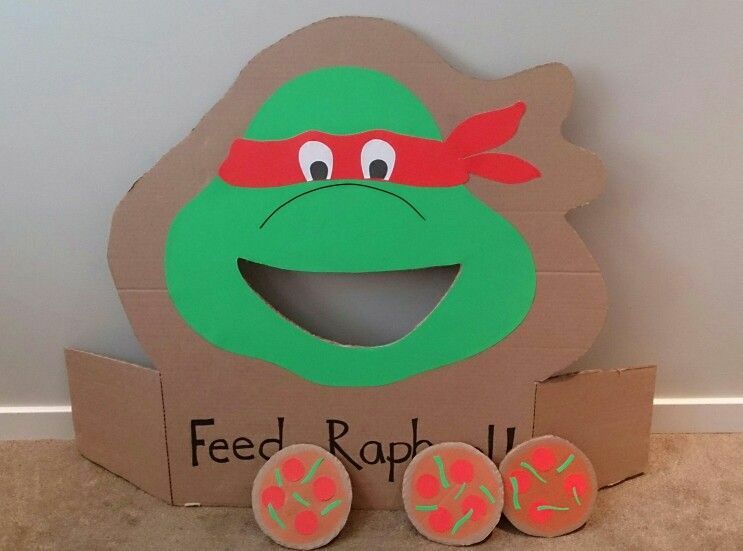 Teenage Mutant Ninja Turtles on this whimsical cardboard pizza toss game delight kids and parents alike. To make this for a festival, we enlarged the pattern and traced it onto heavy cardboard. We cut circles for pizzas from side panels. Tempera paints brightened up the designs, and the game became a favorite every year once we solved two design flaws. The cardboard side panels kept collapsing, and the youngest children could not fling like frisbees successfully to sink two of four pizzas in the pie hole. Tilting the main board slightly against a chair gave them better odds and made retrieving them easier. Making a plywood model with A-frame support gave us a sturdier board that has lasted several years. We tilted the board back so if little hands’ pizza throws miss the mouth, they will slide down the board to land inside. We kept the cardboard pizzas and made spares. 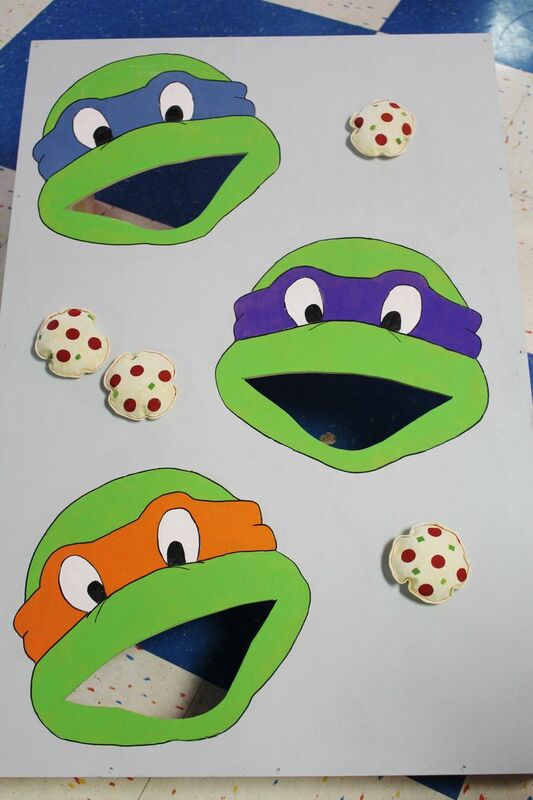 Adult fans kept commenting that the real TMNT with the orange mask didn’t like pizza, so on the plywood model, we painted it the red color they all wore in the beginning. We painted our pizzas pepperoni because it was easy, but real TMNT like strange things on theirs like jellybeans or clams. You could paint different sets of pizzas depending on your event’s theme. I found two versions of this carnival favorite with different purposes. One basic design uses painted long-neck bottles placed inside a crate where washers are tossed, hopefully, to ring a neck for a prize, or family can play to see who rings the most necks not attached to family! You will need one dozen clean, longneck bottles of uniform circumference, but you could have varying heights. Cover with gloss enamel paints in several colors, and let dry. Use rubber washers or painted jar lid rings to toss. You will need to judge ring size by how much space they need to fall onto a bottleneck once the bottles are crated. Make sets in different shaped containers for large gatherings. So super easy and refreshing is this version of ring toss from Landee’s Cousin Carnival ideas. 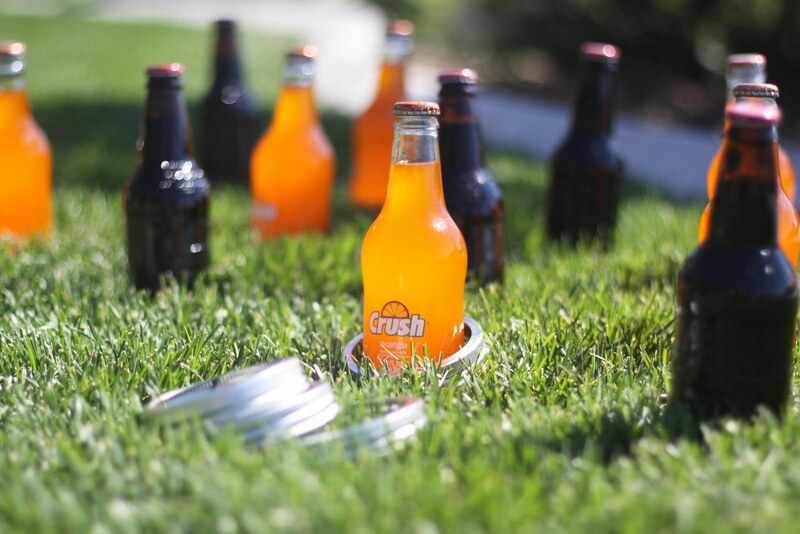 Set longneck single-serve bottles of colorful pop spaced 6 or more inches apart on the lawn. Toss large-mouth canning jar lid rings to claim it as a prize to enjoy later with lunch or supper. Any single serve bottle will do as long as the lid ring fits easily over it. To keep them chilled, you could place the bottles in a large container like a plastic kiddie pool filled with ice. Paint the jar lid rings different colors so each child knows which one is theirs when it’s time to pour it down the hatch. For large events like fundraisers with a midway theme, use two-liter bottles of soda pop. Sweet summer nights swinging on the porch with the kids running around the yard chasing fireflies or playing tag, ah, what fun! End of day energy burning brightly still? You can set up glow bowling with simple supplies like 10 each glow sticks and water bottles and a soccer or basketball. Bottles need to be filled with just enough water to allow room for dropping into each one a glow stick. Activate and drop in the glow sticks, then securely replace the lids onto the bottles. Line up the bottles like bowling pins with one in the front, followed by rows with two, three and four in the back. Set different distances for wide ages ranges playing to keep it fair. When the glow sticks are spent, add a few drops of food coloring to convert glow bowling into a daylight delight all over again. Make an outdoor version of this classic game using five, 4x4x4 wood cubes sanded smooth with rounded edges. Paint the dots using stencils, and seal with polyurethane. Place in a laundry basket or milk crate to roll. 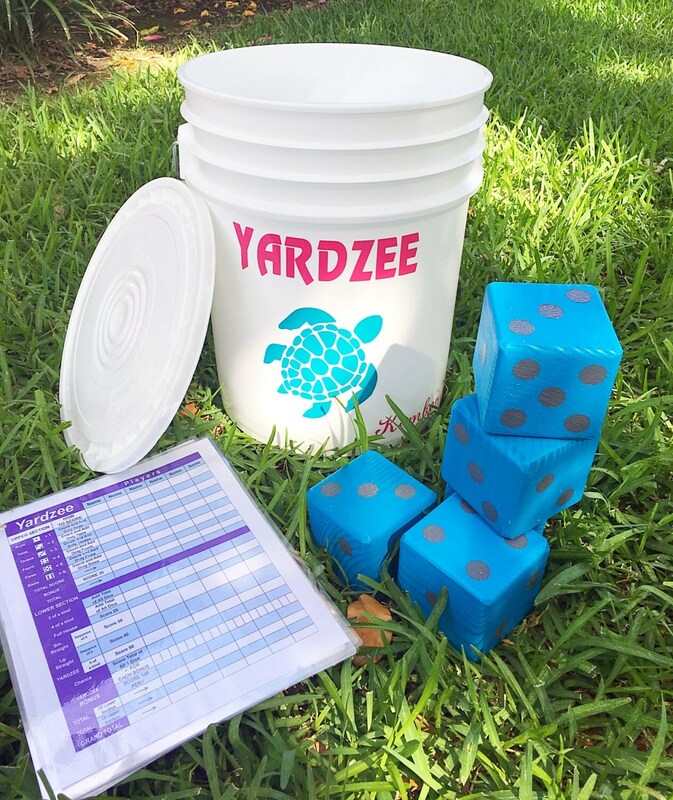 Mark, paint and label a dry erase board like the official Yahtzee score sheet, or create your own. I like the versatility of playing different dice games too. Glow in the dark paint that charges in sunlight will keep the fun rolling after dark! Make multiple sets for fundraising tournament play. Did you find this list a fun, inspiring springboard to new outdoor games you can make? What I like most about these games are that they can be played outdoors on a variety of surfaces or moved into a covered area if it rains. They are great for taking along on picnics or tucking into the RV to ignite friendships along the way. Best of all, they are perennial favorites sure to keep fundraising activity tickets coming in for multiple rounds. Tell me your ideas below, and please share the article to keep the fun going! Budget Friendly Summer Fun At Home!